This post is sponsored by House Foods, who I love for their amazing Shirataki noodles. The noodles are made from tofu, making them gluten-free, low-calorie, and have a totally unique al dente texture. So yum! My friends, you could be eating this dish in as little as 15 minutes! I swear I’m not lying. Creamy noodle goodness is coming your way, and it’s coming your way fast! 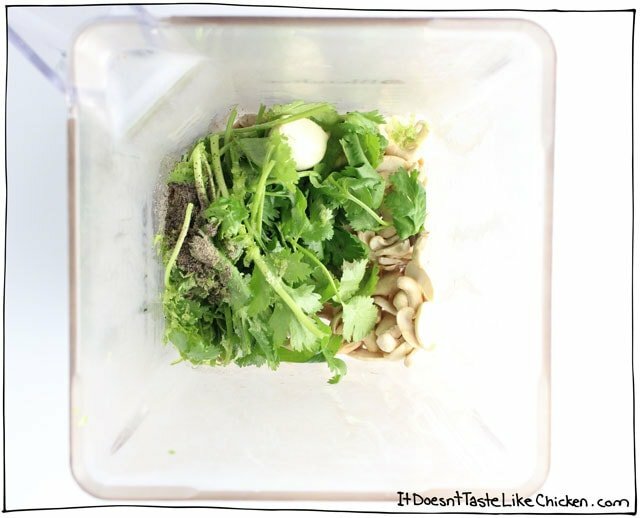 Just toss cashews, cilantro, lime, water, salt and pepper, into a blender and whizz that up. Pour over cooked Tofu Shirataki noodles (which take only 3 minutes to boil). Toss. Heat through for about 2 minutes. Boom. Dinner done. Yes, just like that. Drooling yet? I thought so. This is the PERFECT dish for spring. Quick. So you don’t have to spend those first warm nights slaving over a stove. Fresh. 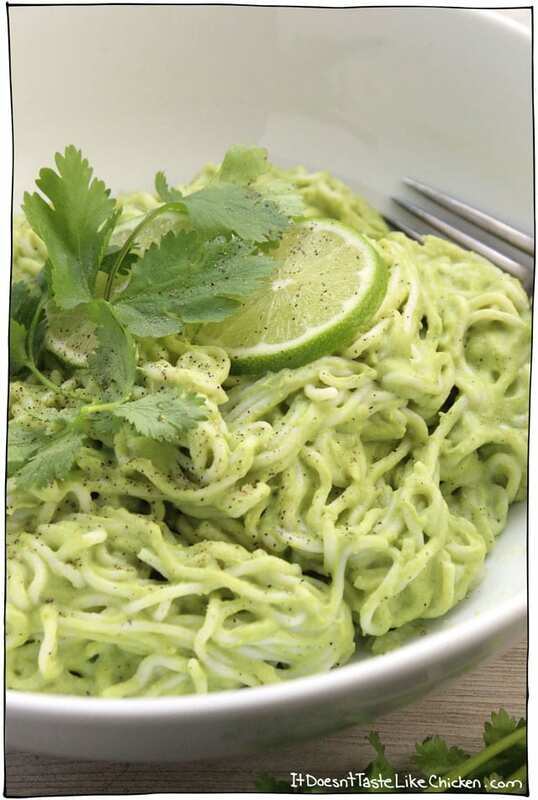 So creamy and bursting with the zing of the cilantro and lime. Light. Tofu Shirataki noodles aren’t too heavy because they are so low in calories. 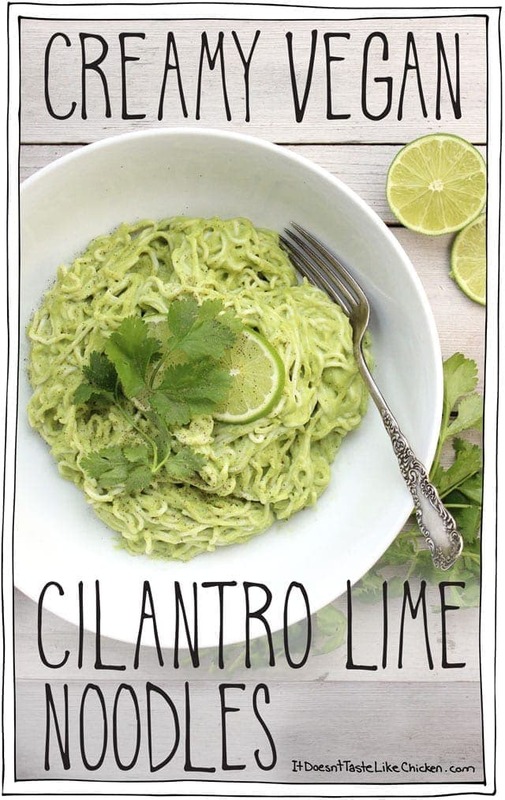 These Creamy Vegan Cilantro Lime Noodles give me a total spring in my step… get it?… Get it?? (You love my bad jokes, admit it). I love when I am able to make a great recipe from just a few simple ingredients. I almost always have all the ingredients needed on hand for this recipe. Happy kitchen dance party! To make these delectable noodles, just toss everything in a blender (except for the noodles, because that would be weird). Then blend until creamy and smooth. See, all creamy and smooth. In the meantime bring a pot of water to a boil and cook the Tofu Shirataki noodles according to the directions, then drain. Put the noodles back in the pot and toss with the sauce. Heat for an additional minute or two, to thicken the sauce and warm through. Just 15 minutes to make! So quick and easy, and made with ingredients you probably already have on hand. Gluten free and oil free. This recipe is so quick and easy! Ready? 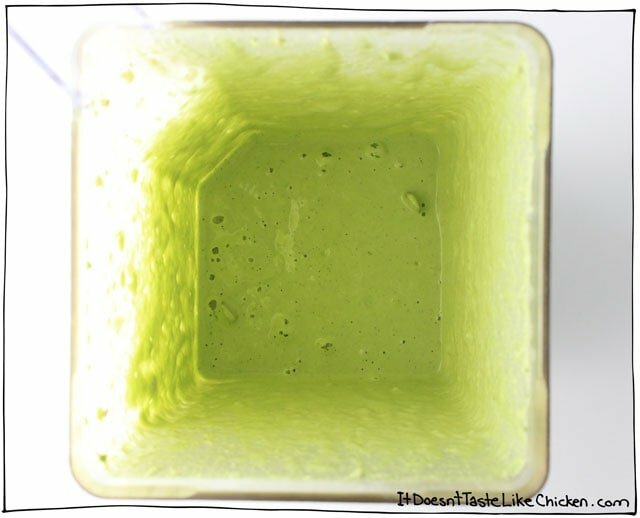 Add the cashews, cilantro, water, garlic, lime zest, lime juice, salt, and pepper to a blender and combine until smooth and creamy. Cook the Tofu Shiritaki noodles according to directions, drain then return to the pot. 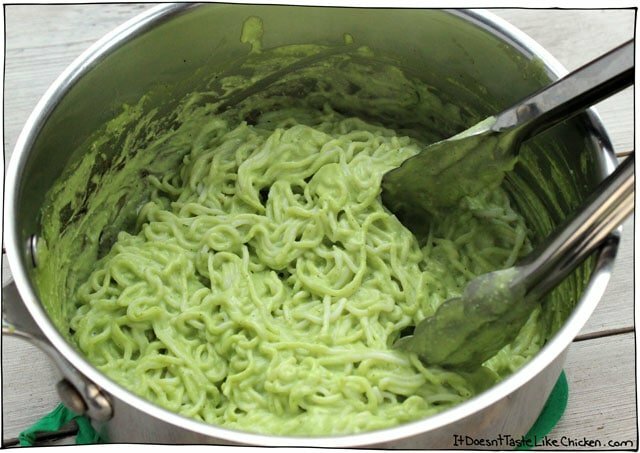 Add the cilantro lime sauce to the noodles, and toss to combine. Heat for another 1-2 minutes until the sauce has thickened and everything is heated through. Enjoy! If you do not have a high-speed blender such as a Blendtec or Vitamix, you will want to soak or boil the cashews first so they will be soft enough for your blender to process. To soak the cashews: cover the cashews with water and let soak for 6 hours or overnight. Drain before using. Or, to boil the cashews: add the cashews to a small pot, cover with water and boil for 10 to 15 minutes until cashews are very tender. Drain before using. For Tofu Shirataki noodle nutrition information click here. The noodles sound interesting but not something I can get here so I went with regular linguine pasta. That steered me in the direction of doing this with basil rather than cilantro and I stirred in some petit pois peas to boost the vegginess and give some textural variety. Delicious and a very pretty colour! Thanks for the recipe, it made a fab starting point! Mine did not turn out green and I can’t figure out why! I’ve made this recipe a few times before, and my family loves it. However it gives me and my boyfriend really bad gas. I find anytime I soak cashews and use them in a recipe, this happens. I don’t seem to have any problems with cashew milk from the store, can I sub the raw cashews for cashew milk you think? Huh, you must have a sensitivity to cashews. The milk should work fine but it will be much thinner than using cashews. Start with 3/4 cups cashew milk and omit the water. Add more milk until desired consistency is reached. Hope that helps! My husband is allergic to tree nuts, does anyone know if soaked raw sunflower seeds be used in place of cashews in recipes like this one? I haven’t tried it myself, but have heard of people substituting sunflower seeds for cashews in some recipes. If you give it a try, please let us know how it turns out! I made this yesterday, and love it! Very easy and yummy. Probably the best thing I’ve ever made with Shirataki noodles. Thanks for the recipe! 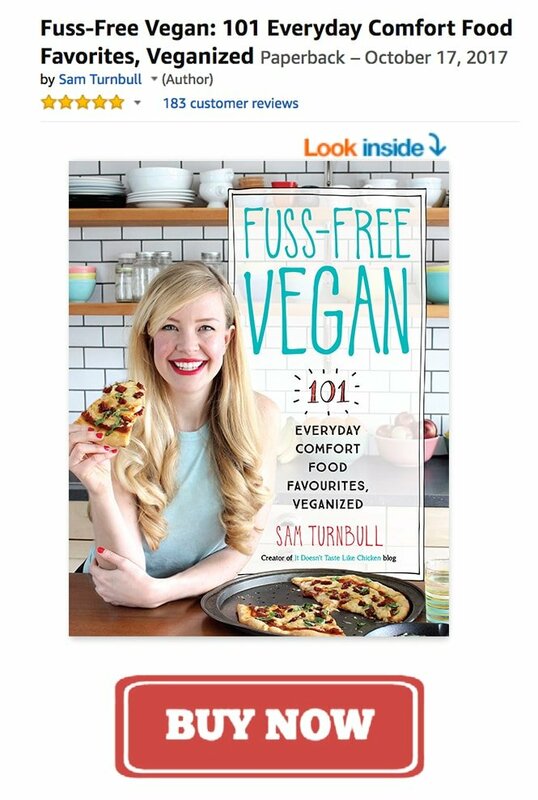 This gave me a perfect reason to try those odd packages of “tofu noodles” I’ve seen. Thanks Sam. This recipe was so easy. I found it made TONS of sauce for 2 packages of noodles; so I didn’t use all the sauce. 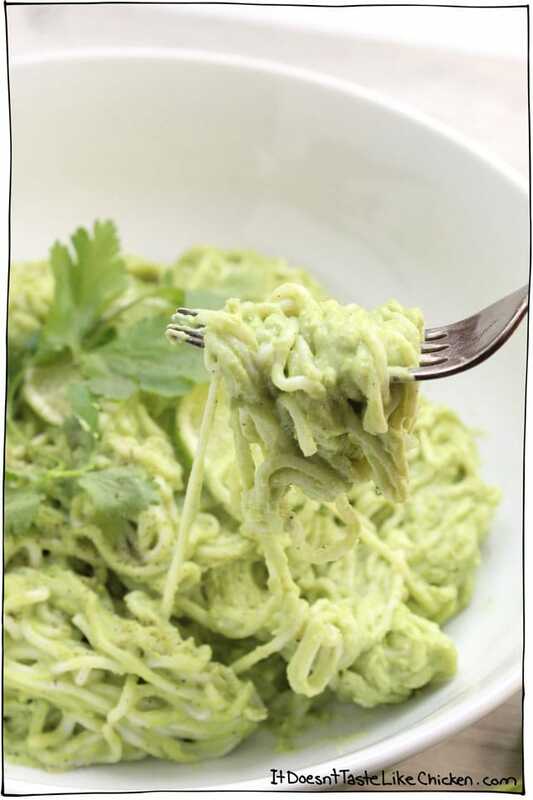 The sauce is super delicious… cilantro and lime, can’t go wrong. YUMMY!! The 2 1/2 year old girl just gobbled these up! She LOVED them… so that’s great… toddler approved! Not a fan of cilantro (or parsley). What would you recommend as a substitute? Fresh baby spinach? Basil? Green onion? Hmmm, a little of each? The colour is fabulous and makes my mouth water. Can’t wait to taste that dish. Yay! The drooling plan worked. I had mom taste it, I should have had you taste it too! haha. The color!! I die. I really want to try those noodles – perfect for satisfying a pasta craving (aka every day) without making you feel like you ate a house. Ugh, the worse. Haha, yes it’s totally true! I can’t believe a whole package is only 15 calories! So crazy. They are surprisingly satisfying tho. Haha, you’re a mean green eating machine! 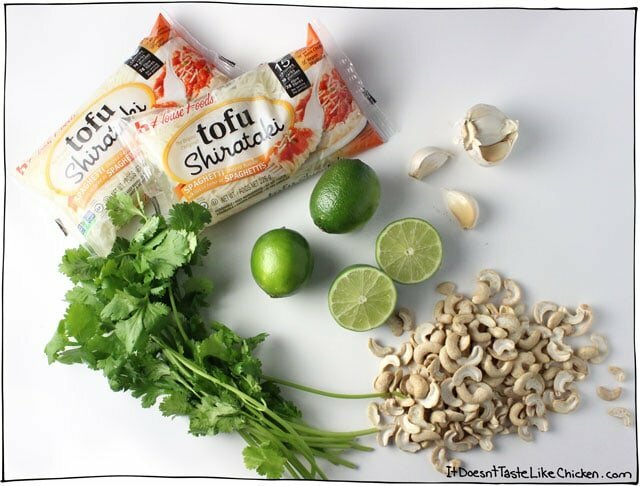 I love using shirataki noodles and always keep at least 3 packages in my fridge! 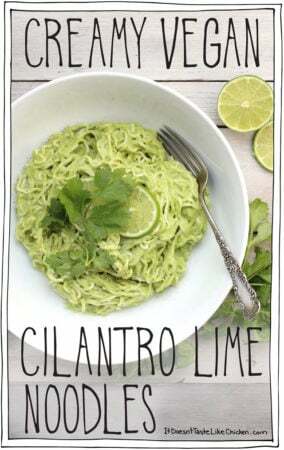 The cilantro lime flavor sounds amazing and the color is so vibrant.